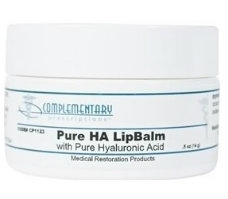 Pure HA Lip Balm is a premium lip balm that hydrates your lips, helping them look and feel soft and supple while naturally reducing the appearance of fine lip lines. Using 100% natural ingredients, this product features hyaluronic acid, a powerful hydrator, along with olive oil, aloe vera, cocoa butter and shea butter, which together provide effective lip protection and rich moisturizing. Only natural preservatives are used in HA Lip Balm. Paraben-free and unscented.